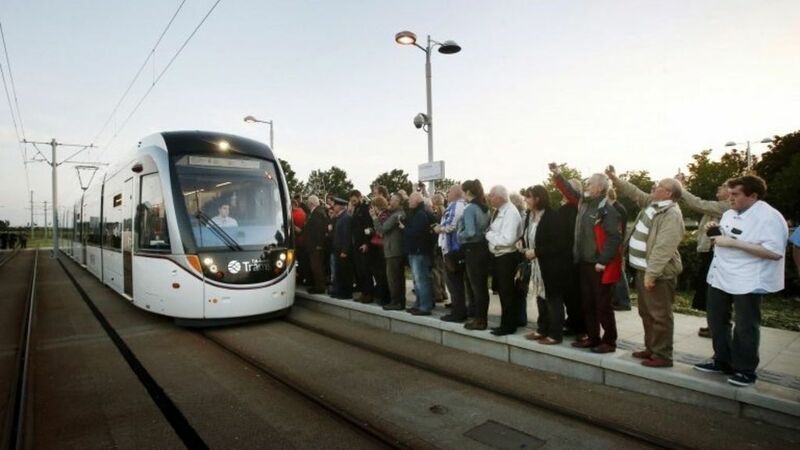 Councillors in Edinburgh have agreed the city's tram line should be extended by three miles to reach Newhaven. The decision to approve the proposal in principle was described as a 'first cautious step' during a meeting in the City Chambers. It follows a council report that recommended extending the current line to Newhaven at a cost of £144.7m. Councillors in Edinburgh agree the city's tram line should be extended by three miles to reach Newhaven. Edinburgh Tram 260 at St Andrew Square on 12 December 2014. 'Errr.. excuse me chief, there's a tram coming..!' A Lothian and Borders Fire Brigade training exercise taking place alongside Gogar Tram Depot on 18 February 2015. Edinburgh tram 254, bound for the Airport, arrives at Murrayfield on a September evening in 2014.